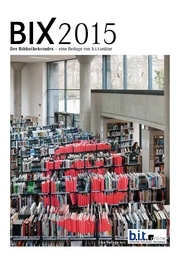 On 23 July 2015 the board of the German Library Association (dbv) and the management of the North Rhine-Westphalian Library Service Center (hbz) decided that this year's BIX, the 16th publication of the index, would be the last one. Although many suggestions were discussed and many roads to find a financially viable business plan for the index were explored, non were deamed suitable. This, however, does not mean dbv and hbz will give up this important topic. Together with experts they will discuss how benchmarking in libraries could and should be continued – not as a renewed BIX but this time as an extention to the DBS. Library Index BIX 2015 is online! The BIX results are online as of today. You can find the results here on the website. Library Index BIX 2015 will be published soon! The BIX results will go live on 15 July. Library Index BIX 2014 published! 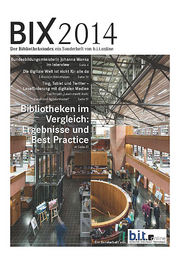 The BIX-Magazine 2014 with the results of the Library Index BIX is now available. In the new issue you find also an interview with the Federal Minister of Education Johanna Wanka and interesting reports on library issues. All participating libraries and the results of the Library Index BIX 2014 can be also found in the data base. Library Index BIX 2015 published! The BIX-Magazine 2015 with the results of the Library Index BIX is now available.